Bendigo are giving away free travel on Sydney Trains, light rail and Sydney Ferries services every Tuesday this April. Simply tap on and tap off using your Bendigo Bank Mastercard when travelling in Sydney and your fare will be refunded within a week*. Click "CLAIM OFFER" to get your bendigo Mastercard to take advantage of the free travel. 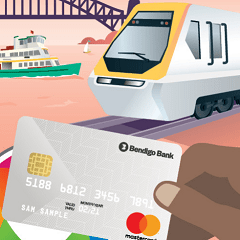 *Bendigo Bank will refund eligible travel costs that are incurred on Tuesdays (which may include the Sydney Airport station access fee) up to a maximum of $15.80 AUD per day. Refunds will be applied to the relevant Bendigo Bank Mastercard by the following Tuesday.